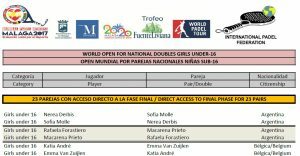 Please find below the provisional inscription list of the Promotional Padel World Juniors Open Championships, that will be held in Malaga October 10-14 2017. We will be one thousand! A total of 359 pairs from thirteen different countries will play to be Champion in Malaga, but also just to play and enjoy a full week of friendship and health sport activities. 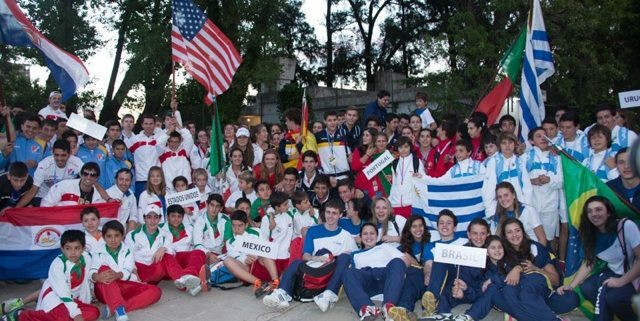 If we consider the promotional Tournaments of Under-20, Under-12 and Under-10, we will have more than 1000 boys and girls attending the events of the XI° World Juniors Championships Malaga 2017. After the publishing of the official sign-up lists, there are 48 hours to make any cross checking and indicates mistakes, then we will be able to make the Draw (Friday 22 morning) and to expose the Programme (Sunday 24). We appreciate the work of the Organising Committee, the supporters and sponsors, and we invite all public to come to Malaga and to enjoy with us during the World Juniors Championships. 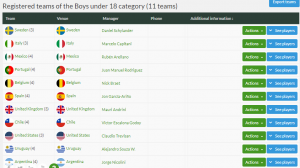 http://www.padelfip.com/wp-content/uploads/2017/08/MundialMenores.jpg 1596 1600 padelfip http://www.padelfip.com/wp-content/uploads/2017/11/FIP1.jpg padelfip2017-09-20 13:57:032018-08-11 11:52:47We will be one thousand! 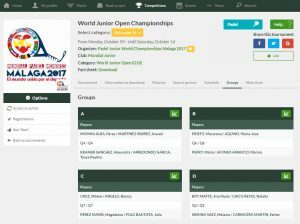 Please find below the provisional inscription list of the Padel World Juniors Open Championships that will be held in Malaga October 10-14 2017. Please find below the provisional inscription list of the Padel World Juniors Team Championships. that will be held in Malaga October 10-14 2017. Almost all countries with costs to the Baltic See have a National Padel Association affiliated to the International Padel Federation! The Grand Opening, held Saturday September 2nd, of Rocca Al Mare Padel Center, also to present the Eestii Padeli Liit (Estonian Padel Association) to the FIP President Daniel Patti invited to comes to Tallinn, and the decision of the Board of Directors of the International Padel Federation accepting the candidacy, close a very important week of our sport, that has to be remembered in the future as probably the most productive week in the history. The Estonian Padel Association arrives to our family after short time but characterised by very efficient carried out work, with association constitution and registry in May, first meeting with the FIP in June, presentation of preliminary documentation in August, and final and complete presentation in the first days of September. We were always informed about the process, since a group of sportive Estonian people decide to bring the sport to their country, contacting friends of Finland and Spain, about the documentation process, the decision to build a reliable padel center, to keep contact with a well known and established group of teachers to launch the first Padel Academy, and to promote the sport in a full integrated area of Tallinn, with tennis, fitness, swimming-pool, but also ice-stadium and multipurpose arena, mainly used for basket and volleyball. It was created the right atmosphere for the grand opening, with Mexican “mariachis” in honour to the country where our sport was invented, with an exhibition where all players could communicate with the public through small microphones and audio loudspeakers, with the availability of people ready to gives advises and the first orientation to our sport. The Open Day organised on Sunday also contribute to gives the opportunity to people of any age to have their first contact with the padel rackets. To the President Armin Kõomägi, the Vice-President Laur Kivistik, to the General Secretary Siim Tuus, and to the Club Manager Keit Sikk, goes our best wishes of success. Estonia, Lithuania, Finland, Sweden, Denmark, Poland and Germany are ready … we will be waiting for Latvia ! It is published the new Technical Rules, recently approved by the Board of Directors. The evidenced text in yellow colour corresponds to the changes related to the text of the previous Technical Rules. ANOTHER NATIONAL PADEL ASSOCIATION JOINS THE FIP ! Yesterday was a day to be noted in bold letters in the World Padel Agenda. Yesterday, during their weekly meeting, the Board of Directors of the International Padel Federation accepted the candidacy of the Dansk Padel Forbund (Danish Padel Association).  We have to inform that the Danish Padel Association was established in July 2009, by Linda Johannsen, Flemming Lauenborg, Torben Larsen and Helle Pedersen who were the pioneers, and who first contacted the FIP offices. Recently, the Danish Padel Federation make an Extraordinary General Meeting and it was changed the Board, today composed by Alvaro Maldonado (President), Paulina Andreasson (Vice-President), Ainoa Richer Jørgensen (Secretary) and Maria Louise Streif Garrouj (Treasure). We gives to all of them our warm welcome. We acknowledge there are various clubs in Denmark waiting for this decision, in order to be able to includes the players in the official FIP tournaments and championships and to have Danish players in the official FIP ranking, organise official courses with the FIP Educational School, bring some official FIP Tournament to Denmark, and look forward to have an organised structure controlling Padel in the country, including all Padel clubs already established, and to start with cooperation projects with the Scandinavian colleagues of Sweden, Finland and Norway. We are very happy to have a new Member, and we are already 33 ! The DPA headquarters are now located in Odense, in the middle of the country, and it will be the Federation centre from where Padel will be managed in all Denmark. http://www.padelfip.com/wp-content/uploads/2017/09/18402853_1251548541628601_2531890539121151993_n.jpg 531 960 padelfip http://www.padelfip.com/wp-content/uploads/2017/11/FIP1.jpg padelfip2017-09-08 11:20:202018-08-11 11:47:36Member 33! Welcome Denmark!